It's recently been named the most haunted castle in the UK, but how much do you know about the paranormal activity which occurs in this medieval castle? Test your knowledge with this tricky paranormal trivia quiz. Can Ghost Hunting Apps Contact The Dead? More and more ghost hunting apps are appearing on app stores, but these tools have left paranormal researchers debating whether they can really contact the dead or not. In order to prove the existence of the paranormal, we must investigate every single possible explanation for the activity and eliminate these as causes, this can lead to a greater understanding of the world around us. What Type Of Ghost Is In Your House? Think your house might be haunted? 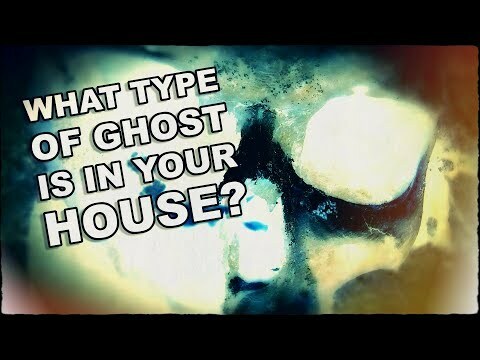 Well, if it is then this video will help you work out what type of ghost is residing within your home. An amateur ghost hunter at Berry Pomeroy Castle's Ghosts in Devon captured what appears to be two spirits riding horseback past the castle at night. It is one of the most famous haunting cases in the UK, but how much do you know about the paranormal activity which occurs in this medieval castle? Test your knowledge with this tricky paranormal trivia quiz. Have you ever wanted to follow in the footsteps of the Ghostbusters and lead your own real-life paranormal investigations? Here's a guide on how to get started in the fun and fascinating world of ghost hunting. British horror film 'Ghost Stories' hit cinemas this weekend, proving that writer directors Andy Nyman and Jeremy Dyson know their stuff when it comes to the paranormal. Just how easy is it to start a career in parapsychology and how do you go about getting trained and gaining experience in this specialised field of psychology? Do Paranormal Investigators Get Paid? How much paranormal researchers make depend on whether they hunt ghosts as an amateur pursuit or as a professional business. Is Zak Bagans' 'Demon House' Real Or Fiction? Zak Bagans released his feature-length documentary horror, 'Demon House', this month and many fans of the 'Ghost Adventures' star have questioned whether the film is an example of mass hysteria or a work of fiction. A strange photo which appears to show an eerie figure watching a young child and her dad playing in an indoor play centre has people wondering if it could be proof of the paranormal. A new film takes us across America's Old West on a paranormal adventure through deteriorating ghost towns filled with stories of ghostly hauntings dating back to the days of the country's mining boom during the gold rush. The perfect list of jokes for any ghost hunter or paranormal lover, including the best ghostly one-liners and supernatural puns. A historic riverside pub in the West Midlands, built as a family home in the 16th century. It was once used as an asylum and is now known for its frequent reports of paranormal activity. Can You Study Parapsychology At University In The UK? If like me you watched 'Ghostbusters' as a kid and have ever since dreamt of being a parapsychologist like doctors Spengler, Venkman and Stantz who all have a PhD in the subject, then there may be away that you too could get the qualifications you need to start a career as a professional paranormal investigator. Codnor Castle Cottage, also known as Castle Farm in Codnor near Derby is fast getting a reputation as one of the most haunted properties in England. Can a history of murder and four recorded suicides explain that farmhouse's ghostly goings on? Meet the ten most famous female ghosts from the history of hauntings, from fictional spirits in female form from movies, to famous women from history who have come back from beyond the grave. A guide to the essential paranormal investigation skills required to become a professional or full time ghost hunter, including the most scientific research techniques and a guide to the most commonly used equipment. Yvette Fielding and her team of supernatural sleuths from the long-running ghost hunting show Most Haunted, captured their most explosive paranormal activity to date, in an upcoming episode recorded at Derbyshire's Codnor Castle Cottage. Is The Curse Of La Llorona Real? Why Do Ghost Hunters Use Thermal Cameras?